Despite our knowledge of effective reading instruction in the early grades, it is estimated that 60% of fourth-grade students cannot read at proficient levels (National Center for Educational Statistics, 2017). By fourth grade, it is common for instruction to shift from “learning to read” to “reading to learn,” which assumes that students have already mastered basic reading skills like decoding and fluency. 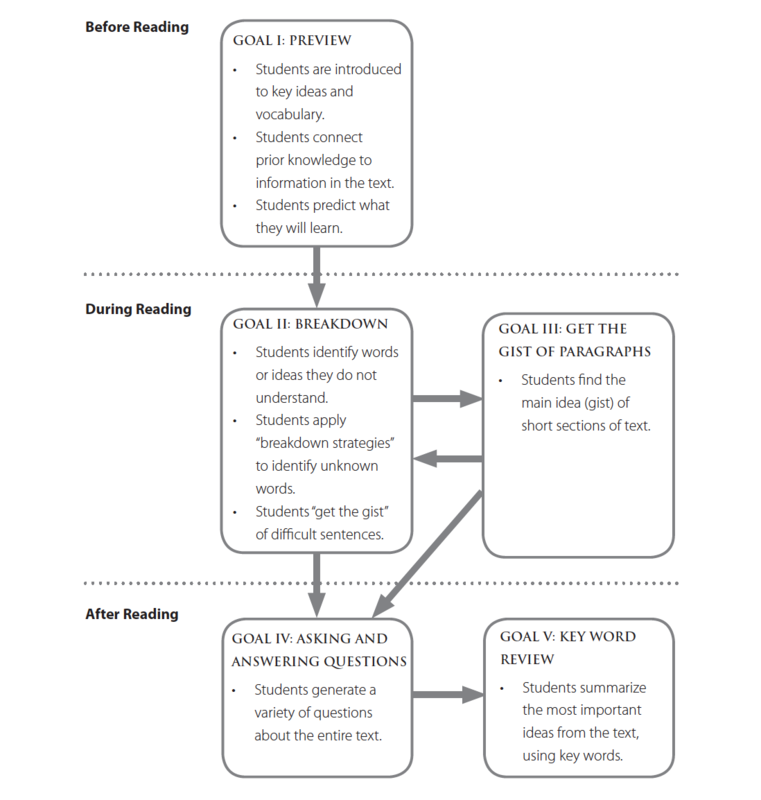 Students in the upper-elementary grades are expected to (a) read more complex text (narrative and expository) with content-specific vocabulary and (b) comprehend at a higher level. These tasks may be difficult for struggling readers who have not yet mastered fluent reading of grade-level text. With decreased instruction focused on learning to read, students who do not read proficiently by the end of third grade will likely encounter additional learning challenges, and teachers must intervene with these students before the gap widens. Comprehension practices that provide opportunities for students to preview text and connect with their knowledge, use self-questioning and self-regulating practices while reading, and summarize what they are learning are associated with moderate to high outcomes. Fluency interventions have mixed results; thus, teachers should integrate both repeated reading and continuous reading into their interventions and monitor students’ progress to determine effectiveness. Word study interventions that assist students in learning to map the sounds of language to letters and words are associated with small to moderate effects; they should be provided to students with reading difficulties or disabilities who continue to have word reading difficulties. Interventions that included two or more components of reading (e.g., word study and comprehension) are associated with moderate to large effects, suggesting that older students may benefit when interventions focus on more than one element of reading. Researchers at The Meadows for Preventing Educational Risk developed two guide books to help educators structure reading interventions for fourth- and fifth-graders struggling with reading. 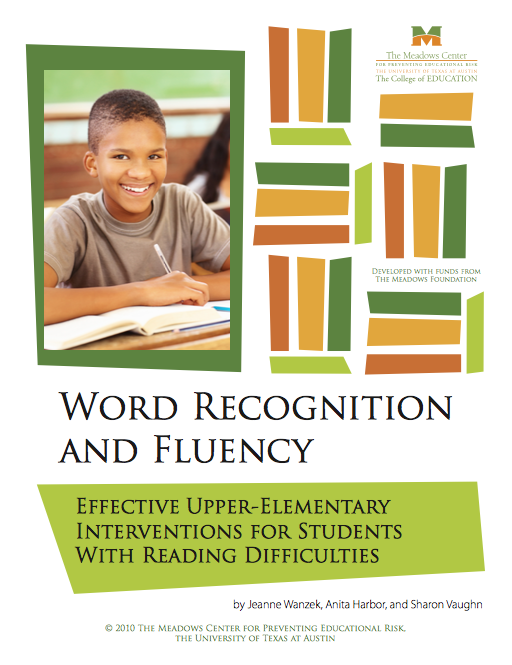 The first guide book focuses on word recognition and fluency and is intended to be used with students who have not yet mastered basic reading skills. 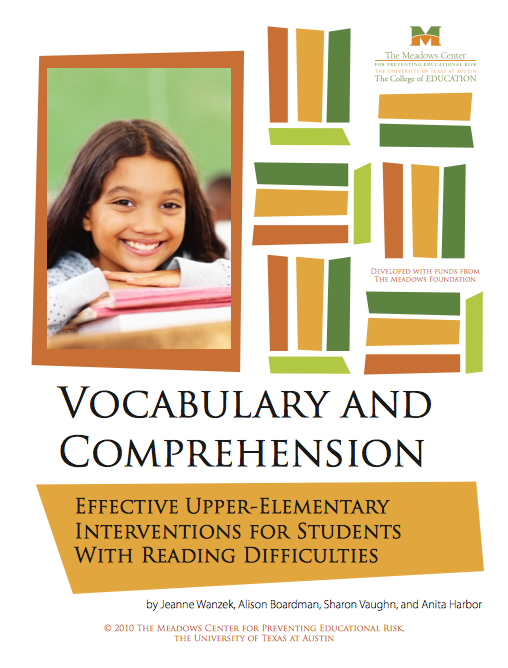 The second guide book focuses on vocabulary and comprehension; these practices will help students gain important vocabulary knowledge and develop strategic reading skills. Each book includes sample lesson plans with identified objectives and teacher materials, word lists, recommended resources, and references. The lesson plans may be used to supplement any curriculum and with any state standards. This guidebook presents lessons that teach word recognition skills and strategies in a systematic and cumulative way. Students build knowledge as lessons progress from easy to difficult skills. Previously learned skills are reviewed, linked to newly presented content, and are included in the new lesson’s practice activities. As lessons progress, students learn the skills and strategies to read an increasing number and variety of words. A lesson structure is also presented for teaching irregular words. Lessons 1-9 are for students who have not yet mastered basic sounds and using these sounds to blend words. Lessons 10-17 teach skills and strategies for reading multisyllabic words. Goal 1: Preview: Before reading, the teacher preteaches important vocabulary and presents the “big ideas” of the passage. Goal II: Breakdown: During reading, students stop after each paragraph or short section of text to identify and repair misunderstandings. Goal III: Get the Gist: During reading, students stop after each paragraph or short section of text to determine the main idea. Goal IV: Asking and Answering Questions: After reading, students generate and answer questions about what they read. Goal V: Key Word Review: After reading, students identify key words and provide evidence of their importance by summarizing the most important ideas from the text. The Texas Center for Learning Disabilities has also developed reading intervention lesson plans for students in fourth and fifth grades that are based on interventions provided in TCLD research studies and align with the practices found effective by Wanzek and colleagues. Fourth-Grade Text-Based Intervention includes “Tier 2” explicit instruction for small groups of four to five students as part of a daily 30-minute supplemental intervention. The 10-day lesson plans align with core social studies unit themes taught in regular fourth-grade Texas classrooms. Fifth-Grade Text-Based Intervention includes “Tier 2” explicit instruction for small groups of four to five students as part of a daily 30-minute supplemental intervention. The 10-day lesson plans align with core science unit themes taught in regular fifth-grade classrooms. Fourth- and Fifth-Grade Text-Based Intervention with Self-Regulation includes “Tier 2” explicit instruction for small groups of four to five students as part of a daily 30-minute supplemental intervention. The 10-day lesson plans align with core science unit themes taught in regular fourth- and fifth-grade classrooms. Self-regulation strategies are also woven into the instruction. Have questions about reading intervention? Need assistance? Contact us! Follow us on Facebook and Twitter for daily research updates and research-based teaching resources!